A festive dish of the Chettiyar clan in Tamil Nadu. 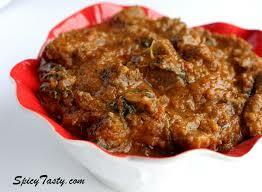 Noisttes of lamb braised in a fiery brown curry flavoured with fennel seeds. Peppercorns, chillies, coriander seeds, ginger, garlic and browned coconut pulp.